A forecast of the Middle Eastern PR market has revealed optimistic industry growth and an expectation of increased profit margins in 2019, but agency heads have concerns over access to talent in the regional market. According to the International Communications Consultancy Organisation (ICCO) World PR Report 2018/2019, which describes itself as ‘a definitive analysis of where the global PR and comms industry stands today and over the next 12 months’, the regional breakdown shows irrepressible optimism about a growing market and growth opportunities for their companies. Almost one in seven PR agencies across the region are confident about the growth of the market while one in six agency heads expect to see a hike in gross profits this year. However, the rankings show agency heads in the Middle East have more concern than other regions across the globe when it comes to sourcing well-educated and trained talent to their sector. Less than half of PR shops feel there is a "plentiful supply of intelligent, well-educated talent in this market" or feel that the "PR Industry does a good job of sourcing talent from outside the region". Agency heads pinpointed retaining key talent, training junior and mid-level staff and motivating younger executives as the biggest challenges facing their business when it comes to talent strategy. Expected salary levels, investment in retraining and a lack of interest from potential recruits were identified as the three top reasons preventing Middle Eastern agencies from sourcing talent outside of the industry. The report also revealed that digital communications was the biggest area of growth last year for Middle Eastern firms and, when it comes to the year ahead, agency heads will prioritise investing in corporate reputation in its annual spend. PR agencies believe clients unwilling to commit sufficient funds to campaigns, and clients too focused on the short-term to be the greatest challenges facing the market. ICCO chief executive Francis Ingham said that despite the geopolitical uncertainty, the PR industry in the Middle East "is growing and looks to the future with confidence". 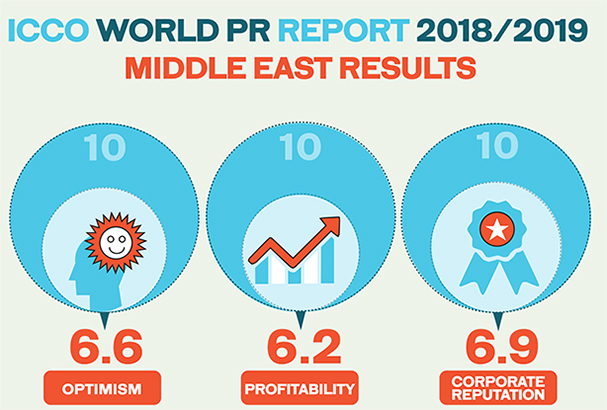 "The most recent ICCO analysis of the Middle East market shows a PR industry that is confident and profitable; but also identifies some key challenges that we need to address," he said. "The headlines are certainly all good. "Agency heads are optimistic about the future, predicting enhanced profitability in the coming year, allied to continued growth in the market. And that growth is driven by dynamics that are simply not going to change: as in every other region of the world, digital expertise is driving clients into PR agencies’ arms." Ingham said CEOs are taking corporate reputation increasingly seriously and investing resource in it. And the shift of advertising spend towards the more nimble alternative of PR and strategic communications is unabated. Despite those encouraging findings, challenges remain. "First and foremost, the agency-client relationship continues to be problematic," said Ingham. "The number one issue facing PR agencies is the reluctance of clients to commit sufficient funds for the objectives they have in mind. And the second most frequently mentioned challenge is a client focus on the short-term at the expense of longer-term results. "In this area, the Middle East is far from being alone. Precisely this same concern is raised by agency leaders all around the world. And to my mind it goes back to one crucial issue that our industry gets better at addressing with each passing year, but where there is still much work to be done - that of proving our value." PArt of the problem, Ingham argues, is that PR evaluation methods are not sophisticated enough to prove the value of communications work. "Until that happens, we will not be able to recruit and retain the very best talent," Ingham added. Ingham said the industry he sees in the Middle East is "vibrant, growing, young, dynamic and innovative". "All of those very positive attributes will shine even more brightly if we professionalise even further the way that we work," he said. "But what is unquestionable is that our industry has never been in a stronger position and that its best days lie ahead of it still."